As at yesterday, a video circulated all over the internet showing Boko Haram Sect beheading a man who they claim to be the pilot of the missing Nigerian Jet. The Nigerian Military has doubts that the man killed was actually one of the pilots. 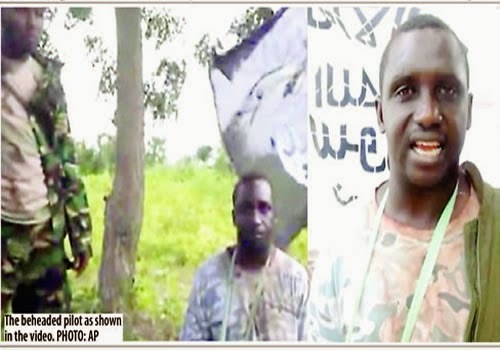 “Experts are doing forensic analysis of Boko Haram to ascertain whether it was a make-believe or there were really encounters between the pilots and the insurgents. “The alleged claim of beheading of the pilot was part of the video clip purportedly released by Boko Haram on Thursday. “We are in receipt of the ‘gory’ clip. We are studying every bit of it in line with military ethics. Do not forget that there might also be an element of propaganda on the part of the insurgents. The video clip has a tint of psychological warfare, but the military is undaunted.The report on the last minutes of the pilots indicated that they had completed their assignment. “They had their last successful assignment in seized areas in Adamawa State. Something was wrong while returning to base. This is what we are looking at.So, they had a successful outing on that day. This is why the military had considered the likelihood of the jet being shot by Boko Haram as ‘remote.’These pilots were among the best in the Air Force; they were always willing to go to the war front even when others were a bit sceptical of the weather or mode of operation. They were thorns in the flesh of the insurgents and they accounted for many successful air strikes we have recorded.